My niece, Katie Anderson, is serving an 18-month LDS mission for The Church of Jesus Christ of Latter-day Saints in the Arkansas Little Rock mission. 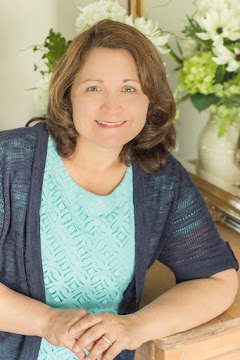 On April 27th, she and her missionary companion live in Maumelle and were awakened to “insane thunderstorms that were off and on all day," but they went about their normal routine as good missionaries do. Later that evening they decided to stop at an apartment of a senior missionary couple . . . a miracle for sure. Suddenly emergency sirens went off, but for them this was “pretty normal once a week,” and then the sirens got louder and louder. After a call from their mission president to “take shelter NOW!” they did so in a bathroom and the couple took shelter in the other bathroom. 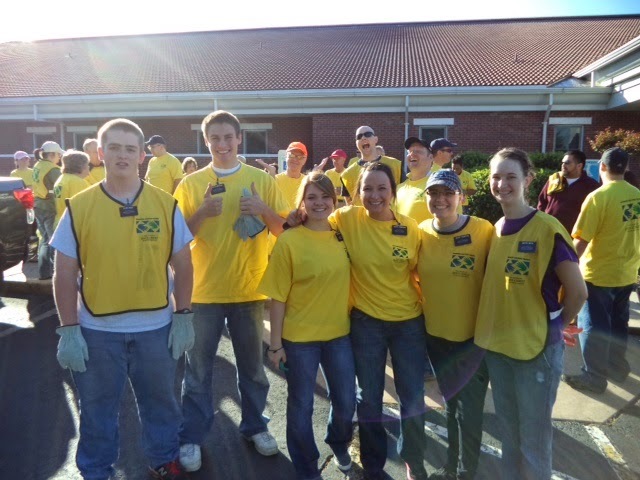 Saturday, May 3rd “over 1500 members from the NLR (North Little Rock), Little Rock, Searcy, and Fort Smith stakes came together with the yellow helping hands shirts to clean up the Tornado damage. I have only seen natural disasters on TV but once you are actually in the aftermath...you know the definition of devastation. It was literally a war zone. 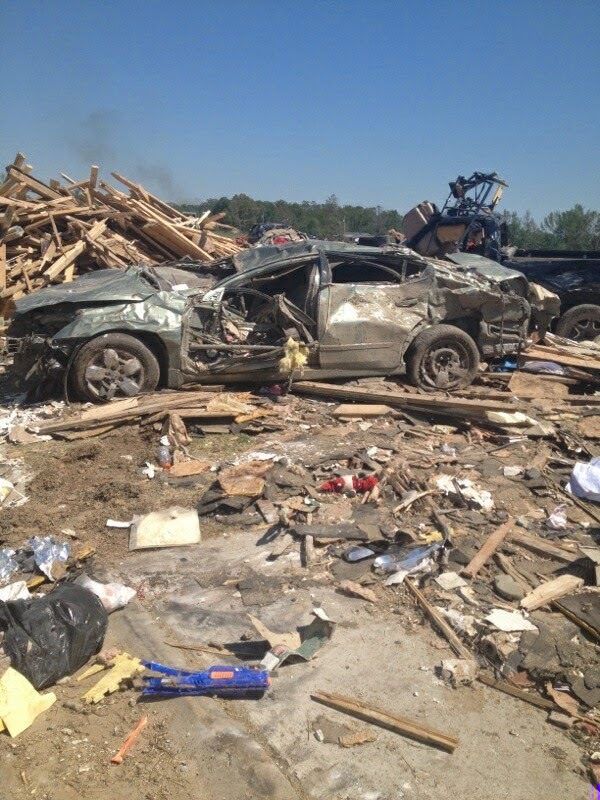 There was piles of debris burning everywhere and valuables in piles where homes once stood." "We started in Mayflower at one home going through items we could save including a bunch of fine china plates! 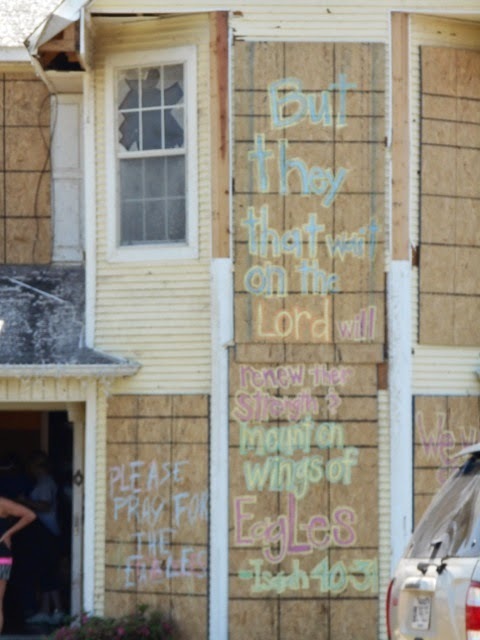 (MIRACLE).. and then we went out to Vilonia to help in a subdivision. That is where the emotions hit. This entire subdivision was impacted. Many lives were lost there. Plus there are valuables and clothes, toys, broken glass, etc...scattered in fields behind the homes. "The whole day is one I will never forget. We were able to help where a home once stood of a member named Dan Wassom who died a hero, protecting his wife and 2 little girls. Another miracle is that another Sister Missionary was able to spot an old missionary name tag connected to a picture of him as a missionary of another member who lived in that neighborhood. So awesome! 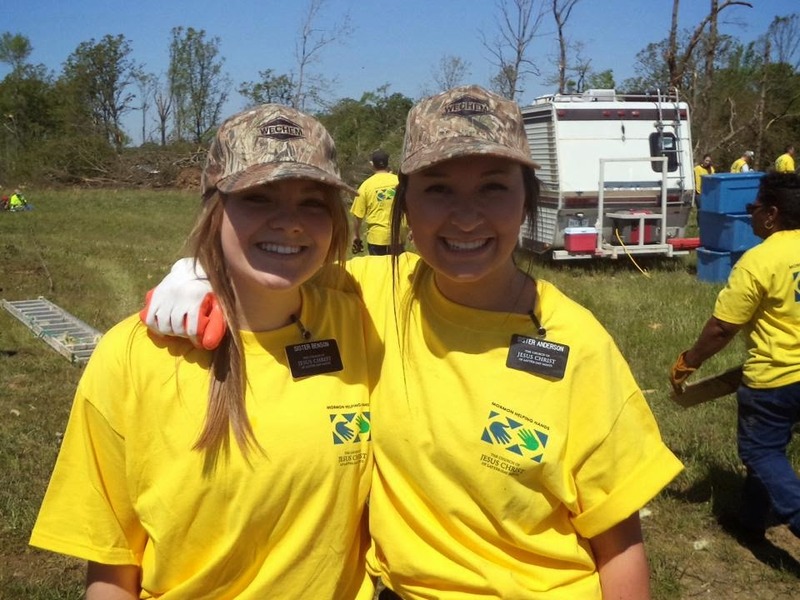 We are so grateful that these sister missionaries are safe and that they are able to lend a helping hand. I love these young adults who go out to serve and deal with the impossible. Sister Katie, Aunt Valerie is praying for you and those who lost family and homes. 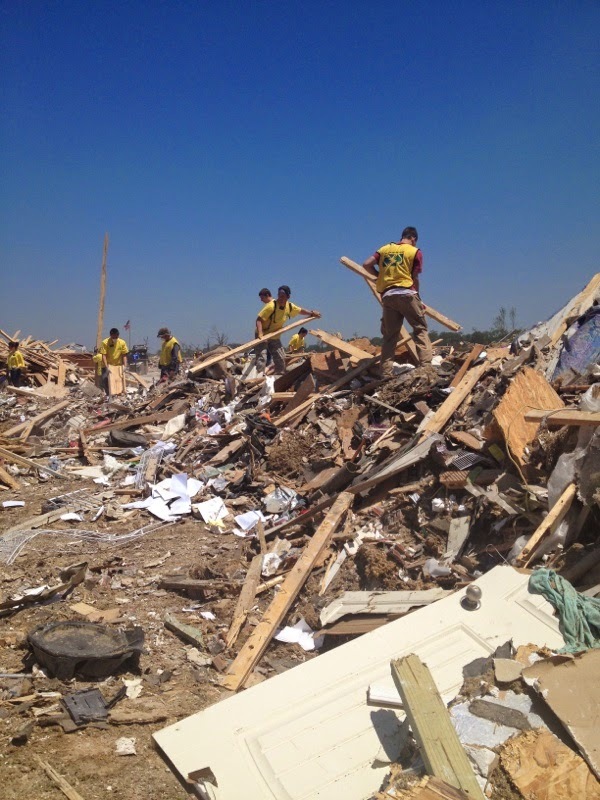 Go here for more pictures and information on the LDS Arkansas Mormon Helping Hands. Wow! I am so grateful that these two sisters (one being my niece) and so many others were safe. How awesome that they are able to help with the cleanup, to help those in need. 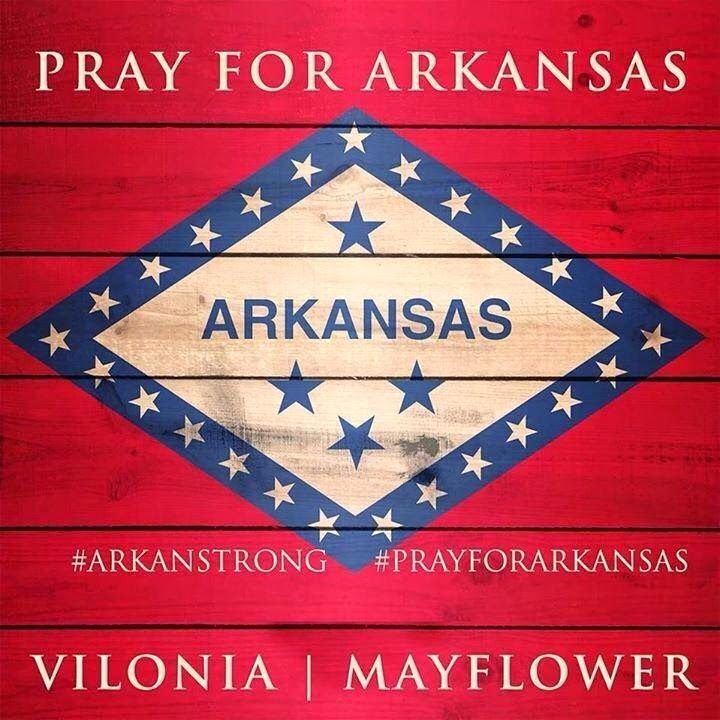 Please continue to pray for those who have lost so much.